Questions on this Kipor Diesel Generator? Kipor Diesel generators are high-value, high-performance, environmentally friendly sources of portable power. From the Sinemaster Inverter Generator Series to the Diesel Professional Series — Kipor has the right Diesel generator to meet your needs. Kipor continuously evaluates and refines our products to assure that you have the latest in efficiency, output and overall value with products that meet or exceed government and industry standards. When you buy a Kipor power product, we are ready to serve you, honoring a full two-year warranty for products in non-commercial use, and one year for products in commercial use. 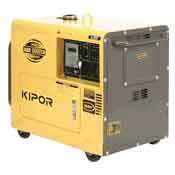 Get the best combination of performance, quality, and value with Kipor generators!